It’s been a time of change at Bolton Town Centre Chaplaincy over the last few months! In September we sadly said goodbye to Laura Barons (pictured right) who retired from her role as a volunteer town centre chaplain. Laura has tirelessly offered her service for quite a number of years as chaplain to Bolton Market. She will be greatly missed by the team and the many staff members at the market whom she has supported- we wish her all the very best in her retirement. Laura will, however, continue her link with Bolton FM where she is a constant support to the staff there and regular contributor to ‘It’s The Thought That Counts’. In July we held our first ‘Chaplaincy Awareness Evening’ in conjunction with Bolton Street Angels (chaplaincy to Bolton’s night-time economy) and Middlebrook Angels (chaplaincy to Middlebrook Retail Park in Horwich). We must pass on a huge thank you to Matt and Evelyn at Bolton Parish Church for assisting us in hosting the event. The aim of the evening was to explain the work of the chaplaincies and, hopefully, attract new volunteer chaplains. The event was a great success with much interest created in all 3 chaplaincies and, as a result, 2 new volunteers have since joined the Bolton Town Centre Chaplaincy team. Diane Jackson, a member of the Salvation Army in Bolton, and Sheila Smith, from the Bridge Church, both began in the Autumn. They have both had a great deal of experience in pastoral roles and are a great asset to the team. Working in Bolton Town Centre can, at times, be very demanding as staff deal with the pressures of meeting targets and deadlines; making profits; dealing with customer’s issues; as well as coping with the stresses of personal and family matters. 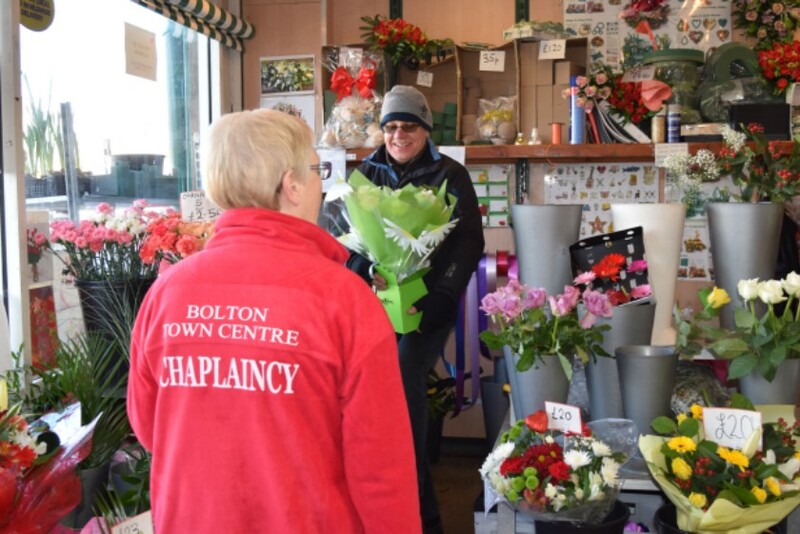 Our aim at Bolton Town Centre Chaplaincy, is to provide a listening ear to those who work there so that they have someone who they can talk to, who will get alongside them and help share their burdens by visiting town centre shops, offices and businesses on a regular basis. During 2015 we have greatly increased the number of staff we visit, supporting the staff in a wide range of issues such as bereavement, illness, dealing with elderly relatives, financial difficulties, shoplifting and marriage breakdown to name but a few. 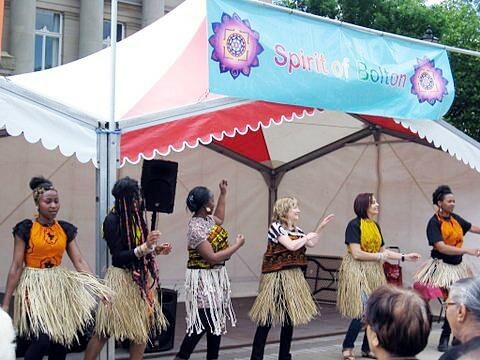 It is only through their continued support that we are able to cover staffing, resources and administration costs which allow us to reach out to those who work in Bolton Town Centre. Areas Covered We now cover the indoor ‘Lifestyle’, food areas and the outdoor stalls at Bolton Market; The Market Place; Crompton Place; Beales department store; most of Newport Street and St Andrew’s Court. Over recent months we have added a number of cafes including Café Create, Third Space and Café Eden; and our new chaplain, Sheila, now visits Debenhams. We are hoping to cover BHS, Boots and parts of Deansgate in the new year. The chaplaincy were delighted to participate in the wonderful ‘Party in the Park’ hosted by St Peter’s Halliwell at Moss Bank Park back in June. It was a fabulous opportunity to build and strengthen community links between churches, schools, community groups and public sector organisations. Our chaplains had the opportunity to speak to every stall holder at the Bolton Food Festival back in August. Also, we organised a ‘Hunt the Pizza’ treasure hunt in the Market Place with the aim of supporting the staff in the shops by increasing footfall and introducing many shoppers to shops they hadn’t been in before. Our chaplains have represented the Community Cohesion Team at numerous events organised by Bolton Interfaith Council and Bolton Hindu Forum over the last 6 months. These included the ‘Spirit of Bolton’ event in the town hall square; world peace prayers events; the Hindu Dussehra celebration at Hacken Lane; the ‘Passport to Faith and Shared Lunch’ at Emanuel Church where children from 7 Primary schools learnt about different faiths; and the ‘Celebrating Diversity’ event at the Market Place (below). There are still many areas of the town that we don’t yet cover so we always need new volunteer chaplains to join the team. Visiting shops and businesses can be quite daunting at times so we have a wonderful team of prayer supports who regularly pray for the chaplaincy. Other than our co-ordinating chaplain, all our chaplains are volunteers but we constantly need to purchase resources such as fleeces, t-shirts, badges, leaflets, cards, bereavement booklets and stationery etc so we would be extremely grateful if you are able to provide any of these resources or finance to purchase them.